Dana Klein '14, elected captain of the Yale University women's track & field team last May, discovered her passion for running as a ninth-grader at Gill St. Bernard's. 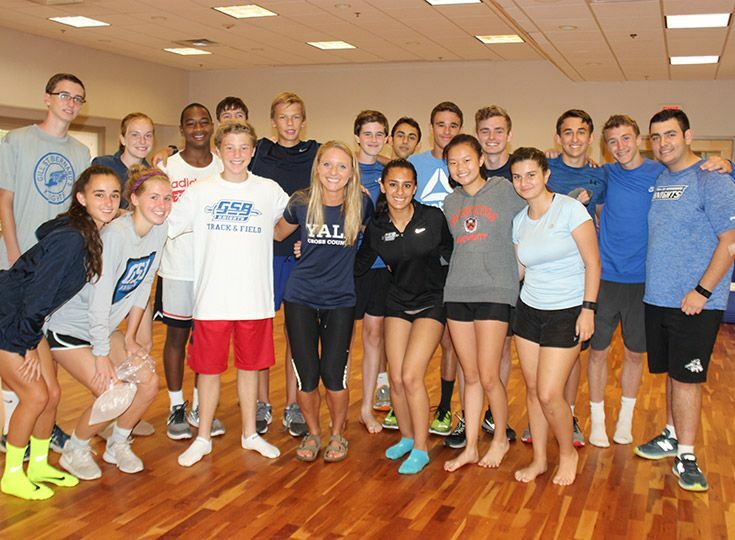 On Friday, she returned to Gladstone to share advice, inspiration and a few training tips with this year's group of cross-country runners. During her talk, Klein focused on how she developed the mindset of a runner. "At Gill, I started to see running not simply as an activity, but as a lifestyle," she told the group. After that, Klein's most ambitious goals started to seem attainable. Similarly, she began to understand that an injury or a bad race doesn't make you any less of a runner. An important part of her seeing herself as an athlete was the encouragement of coaches, teammates and the Gill community. "I remember a Conference Meet at Natirar when Mr. Taeschler and Dr. Lutz came on their lunch break to watch me race," she offers. " It was such a boost of energy and love. I ran for Gill and everyone who supported me along the way." Interestingly, when Klein joined Gill, she considered herself a soccer player. That winter, she decided to try indoor track during the winter and something clicked. She loved running with her teammates and representing her team in the 800m, but she also loved the individual challenge of besting her own time. Wanting to continue her progress, she joined the track and field team that spring. When her freshman year drew to a close, she had shaved nearly 25 seconds from her time in the 800m and was beginning to see running as a vital part of her life. The fall of her sophomore year, she signed up for cross-country instead of soccer and never looked back. "I had seen what focus and commitment looked like, " she offers, "and I wanted to keep going." That year, the cross-country squad won the group championships. "There were no more than six of us," she says smiling. "We were underdogs, but we pulled together and we won." By her junior year, Klein was competing in longer distances. The spring of that year, she broke the five-minute mile at the Meet of Champions (MOC). In the winter of her senior year, she took first in the two-mile at the MOC. In her final season with Gill, she fell short of her goals, placing third in her race at the MOC. "It was important for me to experience the frustration and learn that sometimes you fall short," she said. "With a little perspective, you keep going and it wants to make you chase it more. A bad race doesn't make you any less of a runner." Since that time, Klein has amassed her share of triumphs and setbacks at Yale University. An injury last winter sidelined her, but it did not keep her from traveling with the team and cheering on the other athletes. When the spring season came around, she was running again as part of her physical therapy. Despite not being able to compete with her team, she was elected captain for the coming 2017-18 season. Now as she starts her senior year, she is back to her pre-injury mileage looking forward to running cross-country with her teammates. Introducing Klein to this year's cross-country squad was Stephen Bienko, the school's new Director of Track Operations. A former Division I decathlete and football running back, Bienko brings experience as an athlete, coach, trainer and sports manager to his role at Gill.